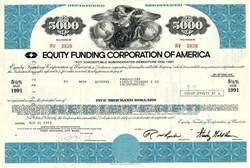 Beautifully engraved certificate from the Equity Funding Corporation of America issued in 1972. This historic document was printed by the Security Columbian Banknote Company and has an ornate border around it with a vignette of an angelic allegorical woman flanked by two worlds. The certificate has the printed signatures of the company's officers, including the infamous Stanley Goldblum as President. Equity Funding changed the way the CPA firms audited clients and this case is taught in every basic auditing class as what to look for in frauds (Enron's auditors must have skipped this class). This fraud also started the floodgate of shareholder suits against outside auditors, which ended up improving the quality of audit procedures and driving up legal liability insurance premiums. This was a multi billion dollar fraud with thousands of fictious transactions that should have been caught by the outside auditors. The Equity Funding scandal lost credibility for Bankers , the insurance industry, outside CPA firms and Stock Brokers. Sound familiar?